"Oh, man!!!???" I groaned as I realized there was NO way the wrapping paper I had on hand was going to get me through the remainder of the gifts I still had to wrap. And going to the store was NOT an option.....You might know I live about an hour away from the nearest store, and I just did NOT have time to go there! I was on a deadline, my friend! So...I got really creative, and here are some things I used to wrap up these extra gifts, just in time! Besides.....Ima just going to rant for a moment. Doesn't it ever bug you that the cost to wrap a gift is often almost as much as the gift itself? Seriously. How crazy is that? THEN there is the WASTE! Doesn't it bother you that you have to fill up an entire garbage bag full of wrapping paper after all the gifts are unwrapped...or maybe even two? We have two sets of grand kids who come to our house every year, so we deal with the garbage bag thing TWICE! At least. Although I'm a bit stressed out, I'm just a tiny bit glad that I MUST find some great alternatives to using wrapping paper---and gift bags too. FTC Affiliate Disclosure: There may be affiliate links scattered around this article. If you click through and make any kind of purchase, I may earn a very small commission at no extra cost to you. Have you ever run out of wrapping paper and needed to get the job done? Are you just tired of wrapping paper waste? Or the COST? Egads! Here are ways to wrap presents when you don't have any wrapping paper handy! 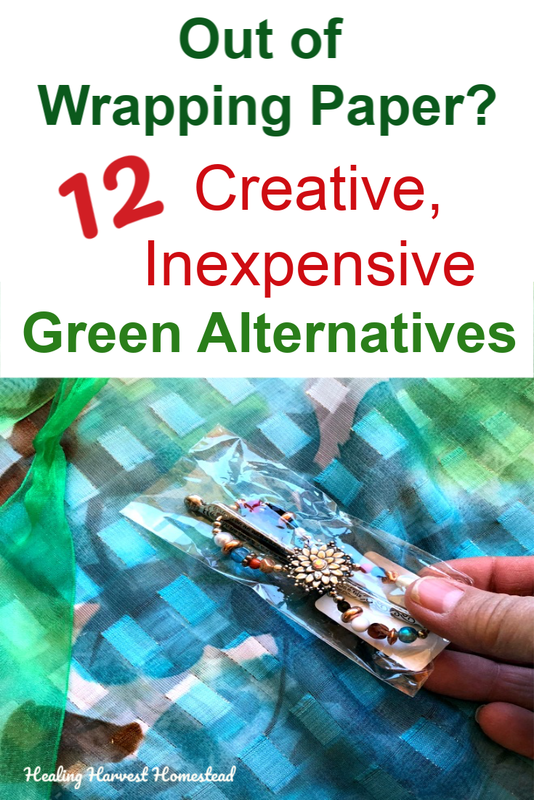 These alternatives to using gift wrap and wrapping paper save money, are creative, and I bet your friends & family will love these best! In a present wrapping jam? Find out how to wrap gifts without paper! 2) Brown Paper Grocery Bags: These are a TERRIFIC option! Especially if you have little hands that can help you decorate them with cute Christmas designs! Just cut them apart and use the inside portion that doesn't have the garish store design on it. Or—turn them inside out and stamp them up for a personal touch. 3) Mason Jars!!!!! One of my favorite ways to wrap a gift is to use Mason Jars as the container. First of all---I think everyone loves Mason jars. Second of all, all you have to do is put some cute fabric around the lid and it's pretty! No fabric, you say? Just use a coffee filter! And you can decorate that, too if you want! Here's a gift I got ready for a friend with a theme of fermentation! 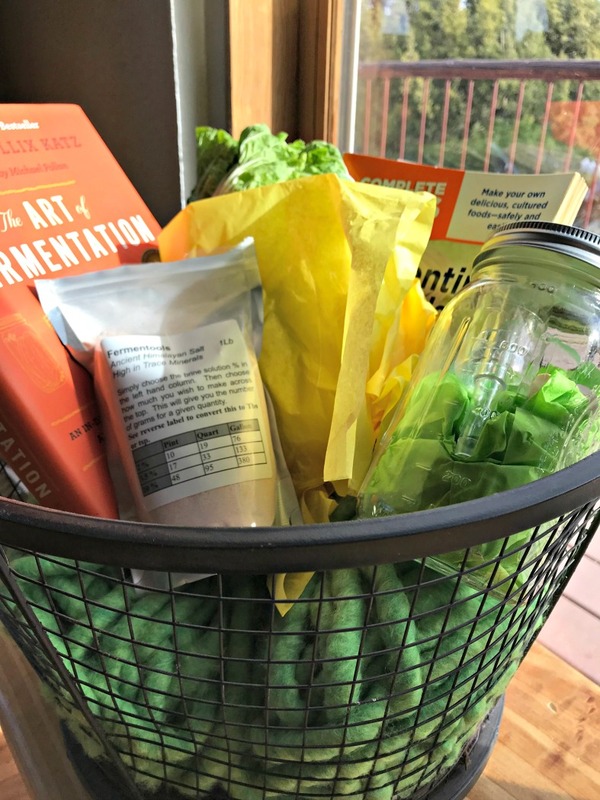 This gift was wrapped using a combination basket and Mason jar! Isn't it great? 4) Cloth Bags: You know those little cloth bags that hold jewelry sometimes? Or sometimes even shoes or purses? I hoard those things because they make GREAT alternatives to wrapping paper. Usually they are brightly colored and cute, but even if they are plain white, they can be easily dressed up with a pretty ribbon and bow. There are tutorials all over the place for them, too. You can also find them on Amazon—-or even just use some plain but useful organic muslin bags! 5) Large Pieces of Fabric: Do you have leftover fabric from a project? Well, even if you don't sew (that's me), all you have to do is center your gift, and gather the fabric up around it. Tie it off with a pretty ribbon and you're all set! 6) Burlap Bags: We often get feed in these burlap bags, and like the fabric idea above, they work very nicely for a rustic looking gift wrap! Even if you don't get your feed in them, the feed stores sell them for around a buck, so Mr. V. and I grab them when we see them. They are handy to have around! 7) Cute Shopping Bags: You know those shopping bags that people who are really "green" use? Well, they are super cute these days, and make wonderful gift bag options. Just tie the handles together with ribbon. Here are some great eco-friendly bags! 8) OK---We're on the Bag theme, here, so how about a Pillow Case? 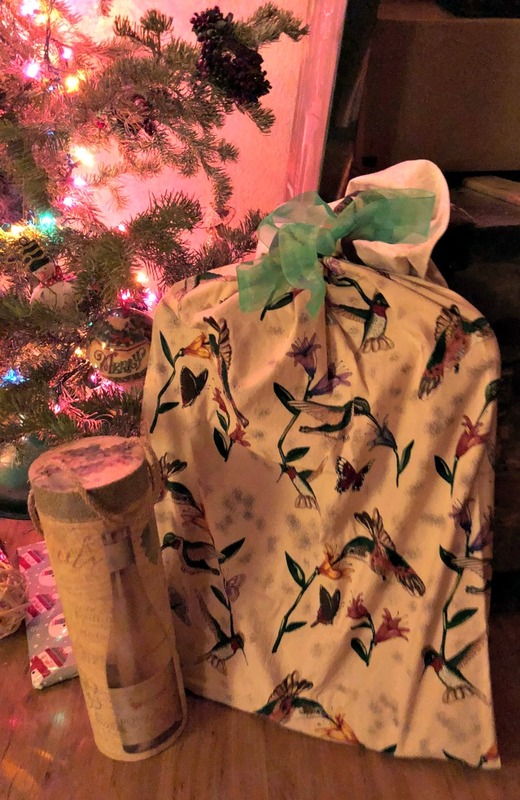 You might be thinking that's true desperation, but really, if you have an old pillow case, you can dye it with a tea rinse for a rustic look, place your gift inside, and yep: Tie it up with a ribbon! You thought I was joking about the pillow case, didn't you? 9) Newspaper: Always a great option...Especially the cartoon section. 10) Baskets: Who doesn't love a cute basket? If you are a collector like I am, then you may have some laying around. Otherwise, start collecting! These are easy and pretty ways to contain those gifts! Here’s a great option from Amazon if you don’t have any lying around! 11) Scarves: Do you have some scarves that are just hanging around in your closet that you never ever use? How about having them serve as both a gift and a wrapping? Perfect! Look how easy this is! Here is a really pretty scarf I've had that I never use...and I know it will be perfect as an extra gift....AND to wrap this hair jewelry from Lilla Rose in! Lovely! 12) Blankets or even Towels: Do you have lots of extra kitchen towels? Or maybe those inexpensive fleece blankets that used to be everywhere a couple years ago? Make sure they are clean, and you have a great double duty gift and wrap! Cinnamon sticks---don't they always look cool on kitchen items? The sky is the limit here, my friends! Here's the Scarf/Wrapping before it goes under the tree---Pretty Sweet, right? Cocoa-Orange Lotion Bars---SO cute and extra moisturizing! And here is an article with 50+ DIY Natural Gifts to Make! It's not too late! You guys....I avoid going to town like the plague! In fact, my husband jokes that it takes an army to get me away from the homestead most days. So when I had this little wrapping paper emergency recently, well, I had to get creative. And I saved money! And reduced waste too! It's all good. So what if not all the gifts look traditionally glossy and Red or Green or Silver? Hmmm...which made me think of Aluminum Foil! You could wrap with that too! LOL See what happens? You start brainstorming things, and all of a sudden, you have NO worries any more. Wrapping Paper Problem solved. BAM! Do you use alternatives when wrapping gifts? I'd love to know what your choices are! I am SURE I missed some things on this list, and we'd all appreciate your comments! P.S. If you haven't done so yet, sign up for the weekly newsletter! You'll never miss a thing and get updates and tips not found on the blog. PLUS you’ll get immediate access to the free password protected Resource Library! Woot!